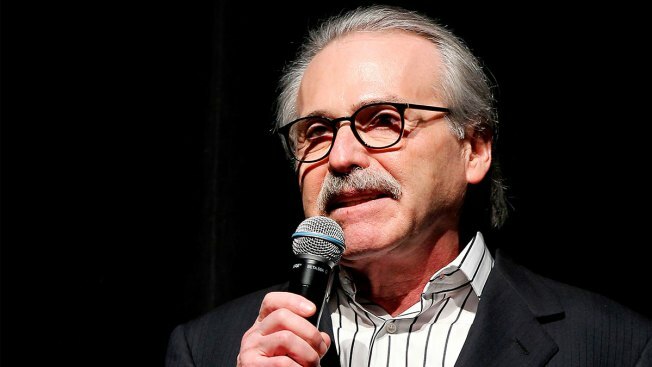 FILE - In this Jan. 31, 2014 photo, David Pecker, Chairman and CEO of American Media Inc., addresses those attending the Shape & Men's Fitness Super Bowl Party in New York. American Media Inc. said Wednesday that the National Enquirer is up for sale, NBC News reported. The company, run by chief executive David Pecker, a friend of President Donald Trump, said in a statement it had decided to change direction and the tabloid title no longer fit with its portfolio of assets. News that the National Enquirer is up for sale was first reported by The Washington Post.